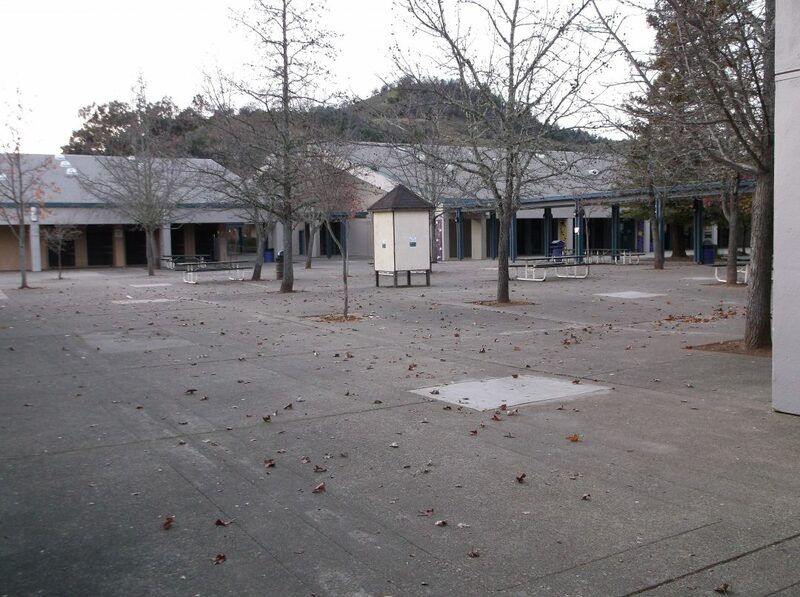 Three stormwater planters will help to slow, spread and sink runoff from this large expanse of impervious pavement in the central courtyard of Ukiah High School. MCRCD is partnering with the Ukiah Unified School District and the Anderson Valley Unified School District to install low-impact development features and teach stormwater pollution prevention at Ukiah High School and Anderson Valley Junior and Senior High Schools. The projects are funded through a State Water Resources Control Board grant called DROPS– Drought Response Outreach Program for Schools and will involve the installation of stormwater bioretention basins, rainwater catchment tanks and rain gardens. Education is integral to DROPS and students will be involved in all aspects of project implementation, including measuring impervious surface areas, landscape design, plant selection of native drought tolerant species, and colorful artistic painting of the rainwater tanks.